Boisdale has created a gentleman’s guide to evening etiquette covering fashion, food and whisky because a proper gentleman knows the ins and outs of style, culture and grooming. He is knowledgeable about food and booze and, of course, knows how to please a woman. A true man of virtue also never stops seeking knowledge. To stand out from the boys, a true gentleman must make these gestures a natural part of his behaviour. 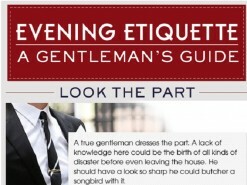 This infographic helps the men become gents with a cheat sheet on dress code, table settings and whisky. This guide helps guide those looking to impress the company around them. If you don’t look the part, you can’t act it. So, know the difference between the distinctive V-shaped weaving pattern of herringbone and the two-toned pattern Houndstooth, which is characterised by broken checks. Learn how to tie a half-Windsor knot. Never underestimate the importance of a dress code. Choose a button down and boat shoe for a day on the town or a picnic and a wingtip collar and a pair of oxfords for the gallery opening. Navigating a table setting is another necessary piece of knowledge. When dining, be aware that the salad fork and knife sit on the outside and the dessert spoon and fork are placed above the plate. When enjoying a whisky, don’t rush; add in a splash of water. Drink it as an aperitif or digestif, not as a main course accompaniment and always consume in moderation. There is no worse offense for a gentleman than losing control.